We used to have a litter box set up in the spare bathroom but as neither Au nor Target used it, we eventually took it away. When Guido joined our family, we put up a litter box for him. I thought it would be temporary because cats tend to prefer the fern patch we've set aside for them in the garden. Guido did prefer the ferns but Au decided that his old bones need an indoor loo. Unfortunately our senior cat was too big for the standard cat tray and when I looked at the prices of a commercial cat loo, I almost died of a heart attack. I mean, RM100+++ for a piece of plastic??? I wanted something large so Au could turn around comfortably, and something with tall walls so he could kick the sand about without making a mess. When I went out I discovered that baby baths are ideal. 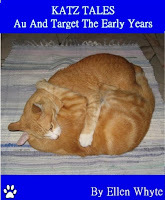 Here is ours - complete with Au as feline model. 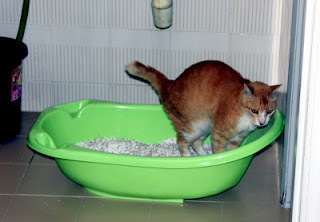 The baby bath cost RM19 and it is filled with three types of sand. There's the clumping stuff so it's easy to clean, the white soft stuff that Au loves best, and a sprinkling of odour absorbing stuff just for being fancy. As it's a big, deep loo, it has tonnes of sand, which also means its' easy to clean. I clean twice a day by scooping and I replace all the sand about once every 3 weeks. Every time Au uses it, I can see him think, "This is pawsome!" Wow, baby baths make awesome litter boxes - who knew? Oh and look at those high sides too! mama cat is so resourceful. I think its an awesome idea to think outside the box and create thinks that are cheaper and useful in the long run. Great idea to use baby bath as kitty loo! That's a very good idea ! you have to be creative even when it comes to loos, lol ! My cats have two litter boxes in the garage, they use it mostly when it rains or it is very cold. Which is the case most of the year, lol ! I like this idea, lots of space for a litter box! Standard litter trays ARE too small. For any cat but a kitten. What a great idea. Yes, litter boxes can be quite expensive! The baby bath is a great idea! It's quite big and deep and looks pretty :-) I love the clumping litter. It is very easy to clean. Mixing different types of litters - you are so creative! That is a terrific idea for a litter box and we might have to check into one! Pee Ess: I just joined Smashwords and put your books in my library 'to buy' list... Will get the two books before the end of July!!! That's a great idea to use a baby bath! We fling litter though so have a covered loo. What a brilliant idea! We have a litter tray for Mrs P which Posky also uses if the weather isn't to his liking... unfortunately he hasn't quite got the idea as he stands in it with his bum and tail hanging over the edge (not saying his bum is big or anything...). Now a baby bath like this might be the answer! "Really? De servunt takes all my dignitee." We have 2 covered cat loos. Have you seen that kind? It gives them privacy and cuts down on the outside the box mess. Olá amigos...Linda foto do seu "banheiro na banheira".... Rsrsrs. Ótima noite e fique com o Papai do Céu. What a great alternative to use for a box! The mom says she's gonna check this out because I'm always kicking the litter out of the box and making a big mess. The mom hates messes. wow...what a luxurious loo you have, Au! we're gonna get our human to check that out, too. we'd love to kick around in it, too. Hi boys! So you didn't want to come nap on my tummy, eh? Well, just as well I suppose. The Human wants to know what RM is--Royal Moneys? Because if that's what it is, I want me some. That was a clever solution to the loo problem. you're so clever to come up with the baby bath idea. What a clever idea - Mum would never have thought of that. Wow. That IS a super loo, Au! We can see why you like it! That is indeed a pawsome idea! I never would have thought of using a baby bath! Will have to try it. Mine go outside mostly in the summertime, but use the box more in the winter. That is a great idea! Mum always has trouble finding nice big litterboxes. Sure you found the perfect solution! GREAT idea to use a babybath as a litterbox ! That is such a good idea. We will have to look for one of those. Those books look great. We just don't have any green papers right now. Take care.